It was pouring rain all day, by the time I was on my way home there were enormous puddles along the roads. Puddles that went midway up the side of a car tire. Puddles with rushing water. I had to step through one of these puddles on my way home. The moment my foot touched the water my left flip-flop was swept off my foot. I was a little shocked and didn’t realize what had happened for a few moments. By the time I did catch on, the flip-flop had made its way into speeding traffic. I thought about chasing after it, but I’m pretty sure if I had I would have been run over. So instead I walked the three blocks home with one shoe. Fun. 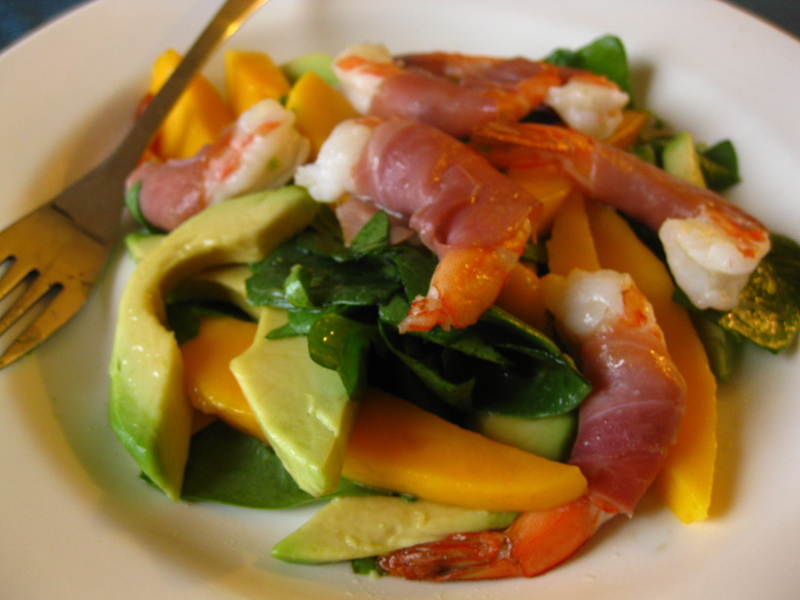 So to bring some sunshine into my evening I made myself a nice salad with mango, avocado, and prosciutto wrapped shrimp. Something about a nice ripe mango makes me so happy, and this one was delicious. The prosciutto also adds a really nice salty-ness to the shrimp. Wrap each shrimp in a small piece of prosciutto, the bake for 4 or 5 minutes. Mix olive oil, lime juice and basil leave and salt and pepper together. Toss mango, avocado, and spinach with dressing. And now I’m going to go eat some ice cream. < Previous I want S’more Pie! It’s just so funny that your flip flop floated away like that! Really sad, but also really funny! I hope they weren’t too pricey…. Ripe mangoes are definitely a good source of happiness! It was just an Old Navy flip-flop, no big loss. It was really the uncomfortable walk home that was the issue. This salad looks delicious and definitely makes up for your walk home. I hate flip flops in the rain! Run away flip-flop, you can’t make this stuff up ;-) When flip-flops go bad they really go bad, overall just not a dependable shoe! I love the name of your salad, I just had to check it out and it looks good, mangoes are so good right now! What a horrible way to come home. Rain and shoeless. I am so glad you had the ingredients to make this lovely salad and ice cream to salve the bad commute. Love the salty-sweet and the smooth creamy – this would brighten my day! aww terrible way to get home for sure! Mangoes do make everything better! Salad looks divine! Oh! That sure look like a sunshine in a plate, so colorful and yummy.